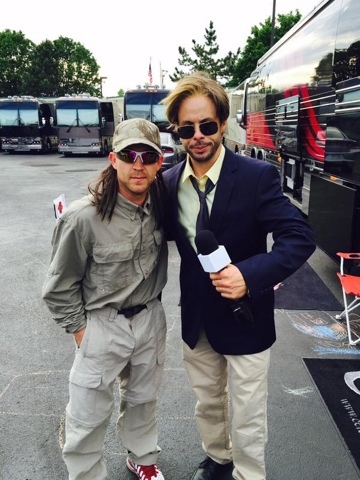 NASHVILLE, Tenn. (April 14, 2016) – YouTube star and prankster Ed Bassmaster helps country music’s Justin Moore go undercover to meet his biggest fan in the premiere episode of “The Ed Bassmaster Show,” airing Thursday, April 14 at 10pm ET/PT on CMT. It will re-air throughout the weekend. For a full list of airdates, visitcmt.com. In the new show, comedian Ed Bassmaster debuts his unique and hilarious characters including Skippy, Mumbles The Waiter and Bushman. Jaws will drop when they see what Justin looks like disguised as someone on his tour who is slightly less famous, all in an effort to surprise one of his long-time fans with a personal meet and greet. Justin’s latest “You Look Like I Need A Drink” is swiftly climbing up the country charts, currently at the No. 25 position. If you haven’t seen the Wild West-themed music video for the song, check it out oncmt.com/videos. “This may be my favorite video I’ve ever shot. I am a huge Western fan, and we shot one with a dose of comedy,” he said. Tune in and be part of the conversation with #EdBassmasterShow and follow @JustinColeMoore onTwitter and Instagram. For more information on Justin Moore, visitjustinmooremusic.com.